Where can a senior go and learn hip-hop? Where can seniors go to make new friends? And where can seniors do more than just play bingo? Amy and Damien Temperley have created such a place called Aging Is Cool. 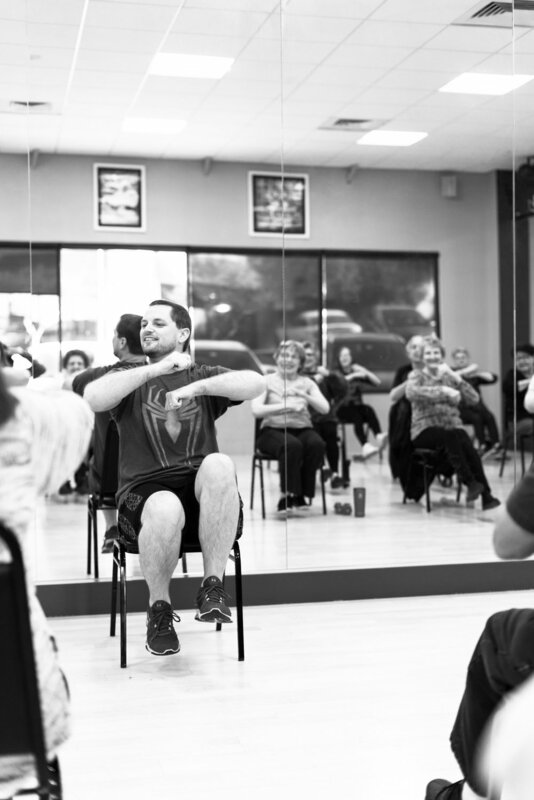 As I walk into one of the fitness classes that Damien teaches, I noticed multiple human beings warmly talking to each other while getting ready for the task at hand. They seem clearly present and ready to mingle while warming up their bodies by walking in a circle. There are lots of hugs and smiles in the room as Damien and Amy get the space ready, while also being available to each person’s inquiries. As the seniors prepare for the class to start, they each claim a chair and keep the conversations going. How did this all begin? Before Aging Is Cool was born, Damien was a physical therapist to older adults in senior centers and Amy was a nonprofit consultant. In there areas of expertise they were both exposed to amazing older people that were capable of so much more than what was being offered in their surroundings. “People think of aging as this really sad, pathetic thing and most people aren’t sick. Most people are quite able to do everything you and I do. And they’re smart as hell and we discount that. We’re just like, ok you’re over sixty, you don’t work anymore, therefore, you don’t have any value,” Amy says frustratingly. The couple wanted to change that perspective and bring recognition to the life and vitality that is still present within this age group. Also, the number one danger among seniors is isolation, so the social element is just as important, maybe even more, than the fitness element. Their goal is to bridge seniors on both spectrums and look at this generation more holistically. The fitness classes include brain training, balance, cardio, boxing and more. 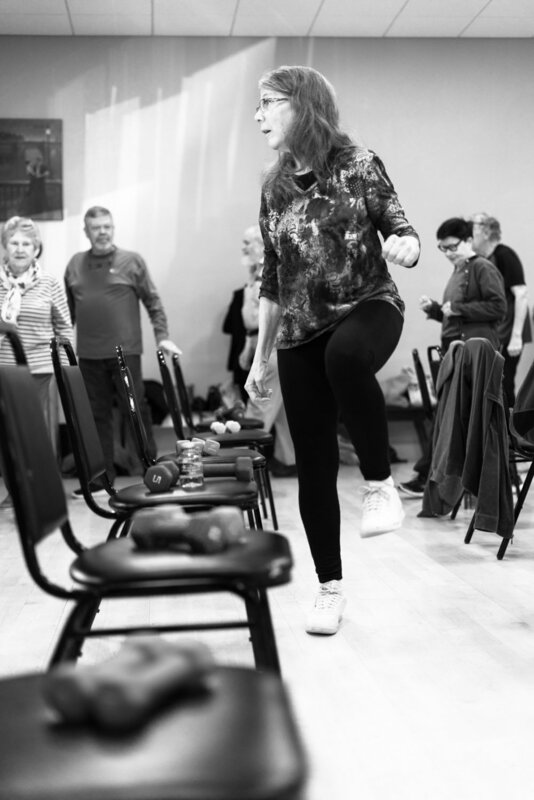 All of the classes are easy and allow participants to push themselves as much as they feel comfortable, either by doing the exercises in a chair or by standing. There are even classes that will be taught by phone if a senior is homebound and unable to physically attend. Aging Is Cool also brings in speakers that teach classes on various interests, from English fashion to French Impressionism, to the history of Dunkirk, etc. In one case, seniors in the Alzheimer unit were teaching and pointing out details in a work of art that the instructor didn’t even notice before. They were still capable of teaching the teacher. They have created a bond, a family, a tribe amongst each other. 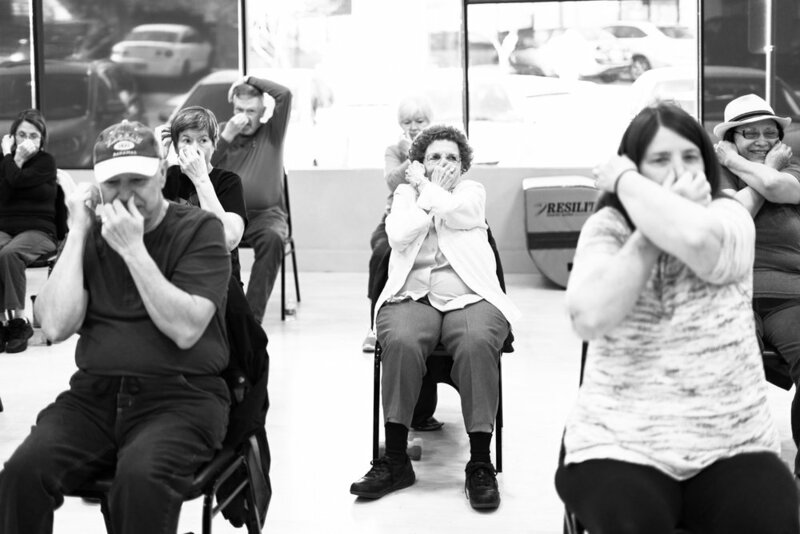 After exercise classes, about 30 seniors plan where they are headed to next. Today, they decided to have lunch at Central Market. Before, they decided to get beer and pizza at the Beer Garden. They tend to be very vocal when it comes to the programming and definitely influence the direction for each event based on their interests. One suggested going to see roller derby, which Amy and Damien are clearly excited to facilitate and make possible. The folks that are able to drive and carpool sometimes make it over to the assisted living centers where some of the classes are held. The people in assisted living then get access to new people and potential new friends. Now seniors who don’t live in assisted living centers delightfully come to check on the new friends they’ve made on their own time. “Friendship, that is bigger than what we do, that there are relationships being developed. They go to the movies, they go to eat, you know, they check in…that is everything.” says Amy. Amy and Damien hope to replicate Aging Is Cool in other areas, particularly low income. They have found the options for seniors in low income areas to be very dismal so they are currently working on a nonprofit model to raise funds in order to make their program more accessible. They will be working with doctoral students from the University of Texas to document, evaluate, and prove that there program actually produces people that are more fit, provide sharper brain activity, and exhibit less depression in order to really build on those goals in the next few years. They also want to make sure they collaborate really closely with all of the nonprofit organizations doing work in the senior space to maximize its effectiveness. 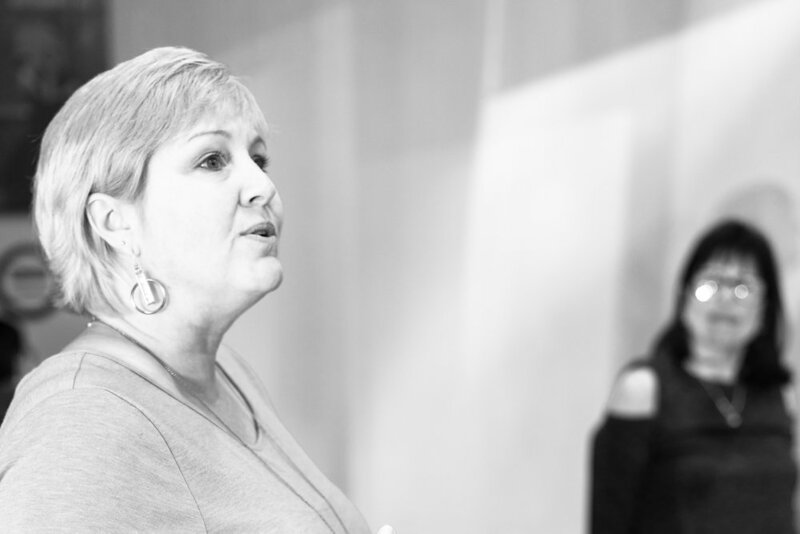 “We don’t have kids…we actually don’t have what we are creating for these folks, so part of it is for us…they are part of our larger family,” says Amy. As I finish talking with Amy and Damien, suddenly Damien jumps up. “I always give her a hug goodbye,” and runs out the door to hug one of his regular students before she leaves. “They’re very close,” Amy smiles. How much everyone matters to each other here is very easy to sense. If you would like to help Aging Is Cool carry out their work with seniors, you can donate here. Is getting older worth embracing?